Farming methods can raise or lower the nutritional value of produce. Planting techniques influence health. We can see this by following a tomato through a large-scale conventional farm compared to a tomato grown in your own backyard garden. On large-scale farms, tomatoes are fertilized with synthetic chemicals. These chemicals cover the basic NPK requirements for plants, but often fail to replace the micronutrients that tomatoes demand from the soil. In your garden, your own homemade compost builds healthy humus-rich soil that replenishes the full profile of vitamins and minerals that your plants require. If the nutrients are not available in the soil, they can’t be taken up by the plant and delivered to the fruit. On large-scale farms, growers select tomato varieties that ripen quickly and simultaneously for ease of machine harvesting. These fast-growing varieties can actually outpace the ability of the plant’s root system to absorb nutrients from the soil. Big farms also select for varieties that produce large, roughly square-shaped tomatoes. These square-shaped tomatoes fit more easily into packing containers and thereby reduce transportation costs. In your garden, tomato varieties are chosen primarily for health and flavor. On large-scale farms, tomatoes are picked unripe, before vitamins, minerals, and lycopene are fully maximized in the fruit. 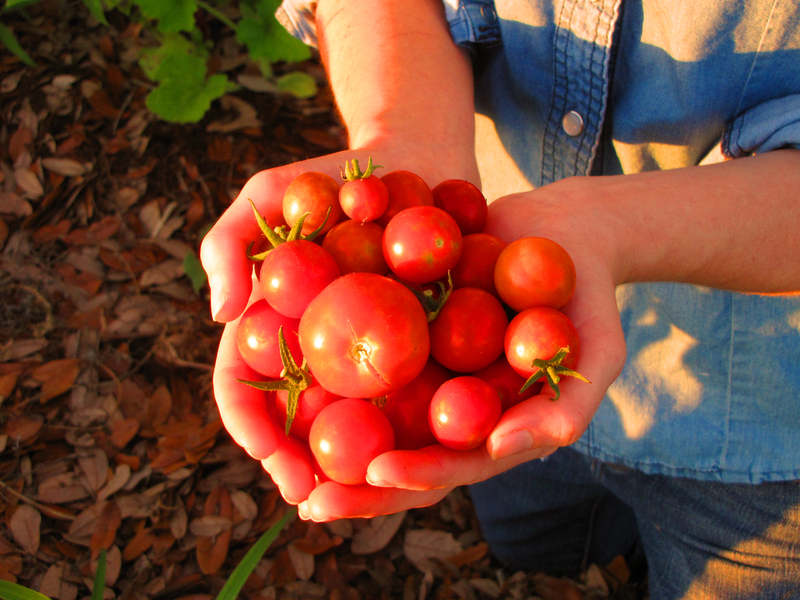 Once tomatoes are harvested, they stop absorbing lycopene. Lycopene is an anti-oxidant, and we want the highest dose of this cancer-fighting compound in every bite of tomato. In your garden, tomatoes are picked ripe and red on the vine with the maximum concentration of lycopene fully developed in the fruit. Potassium is an essential mineral in plant health, and it is critical to human health as well. The best way for people to get potassium is through their food, and the best way for plants to get this mineral is from the soil. On large-scale farms, the plants themselves are treated with industrial applications of potassium. In your garden, potassium and other minerals are added to the soil through compost and homemade wood ash—the ideal source for plants. Moreover, the sweetness of a tomato—actually, the flavor of any fruit or vegetable—is the result of potassium. Potassium molecules unlock the sugars in plants, and when more natural potassium is available in the soil, more sweetness develops in the fruit. It is easy to taste the difference in your own ripe, red, freshly-picked tomatoes, but the differences in health are just as great, and just as important. And your own garden is the perfect place to get the sweetest taste, and the greatest health, from your produce. I knew a good bit of this, but not necessarily the science behind it. Thank goodness we live in a two-tomato-crop-per-year place, because I hardly can bring myself to buy any tomato from the grocery store any more, even those labeled “organic”. Flavor-wise, even those don’t seem to measure up. I agree completely about the flavor of the grocery store tomatoes. Many of the veggies from the supermarket are flavor challenged, but we just get used to it so don’t notice anymore. After years of eating mostly food we have grown ourselves, we have really come to appreciate the way growing techniques influence taste and health. I am so glad too about our long growing season! I know people around town who manage to keep tomatoes growing year-round, and that is real commitment to garden-fresh tomatoes! I hope you are enjoying this beautiful day! Good information packed article. Now I am craving a delicious tomatoe! Growing up picking tomatoes from the vine for a meal, I can attest to the lack of flavour and soft sweetness in commercial tomatoes. But I am looking forward to those luscious tomatoes from your farm! Thanks for your articles. Thank you so much! We are getting ready to plant our tomatoes soon, and I can hardly wait! Thank you for so much information about commercial processing. I don’t think many people realize how much is lost from produce in commercial farming. About the wood ash…would any type of wood work? Are there types of wood that work best or types to avoid? Hello Jennifer! Only use wood from native trees to make wood ash for the garden. In Rockport, we use ash from our native live oak trees. Oak trees make excellent ash for the garden because the bark is very high in nitrogen. However, the pecan trees of Victoria and the mesquite trees of Corpus also make wonderful wood ash for those areas. The key is, wherever you are, to use local native trees. 1) Your native trees have established a relationship of thousands of years with your soil, and your trees contain exactly the minerals your soil requires for replenishment–it is an perfect partnership. Wood ash from a different region will never be as good a complement to your soil. 2) Wood from native trees is the easiest to find and gather, because it is literally falling from the trees! On our farm, we pile up fallen limbs and branches over time until we need ash, then burn the pile and save the ash in air-tight plastic containers. It is important to NEVER use treated lumber to make wood ash, because the chemical used to treat the lumber is dangerous when the lumber is burned, and you definitely do not want it in your garden. Also, DO NOT use ash from any type of trash, or from charcoal briquettes from the grill. Unlike the ash from your native trees, the ash from trash is full of toxins. Thank you so much Jennifer! I am wishing you the very best today! There’s nothing like a homegrown tomato! Hey, anxiously awaiting news on that baby girl! Thank you so much Cindy! I am holding a beautiful little baby girl right now, and will share some news about her asap! I am wishing you the best! It’s less romantic than your other writing but I like that it’s straight to the point, which is what you need when your writing a comparison piece. Thank you so much Kimmi! Sometimes you just have to get down to brass tax! Have a wonderful day, Kimmi!